This package implements the Förstner interest point detector in Matlab. The algorithm extracts junction and circular points from a greyvalue image with subpixel accuracy. It also includes some extensions proposed by Köthe (2003). image coordinates of extracted points with subpixel accuracy. The points are classified into junction and circular points. integer image coordinates of window centers. These windows are used for the estimation of the points mentioned above. More details and an example can be found in the zip file. A Fast Operator for Detection and Precise Location of Distict Point, Corners and Centres of Circular Features. In: Proceedings of the ISPRS Conference on Fast Processing of Photogrammetric Data. Interlaken 1987, S. 281-305. 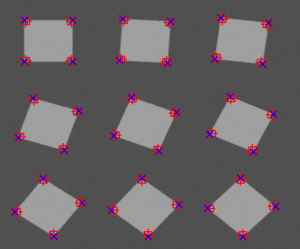 Edge and Junction Detection with an Improved Structure Tensor. In: Lecture Notes in Computer Science (Proceedings of DAGM 2003) Volume 2781, 2003, DOI:10.1007/b12010, p. 25-32, Springer, Heidelberg.